Bengaluru: Five mid-tier Indian IT services companies, which together employed 69,000 people (end-March numbers) and generated $2.5 billion in revenue in 2016-17, saw their aggregate workforce shrink by seven the same year, highlighting a situation created by a perfect storm of tough business conditions and increasing automation. It is a situation that has wider ramifications for Asia’s third largest economy, where the $150 billion IT services business has emerged the biggest job creator in the organized sector. Bengaluru-based Mindtree Ltd and the India operations of WNS (Holdings) Ltd, which together employed 38,000 employees, saw their headcount shrink by 527 in the year ended March 2017 compared with the year-ago period, even as three other companies, Cyient Ltd, Zensar Technologies Ltd and Persistent Systems Ltd, together added 520 people to reach a total of 31,000 employees (see chart). Industry lobby group Nasscom estimates that about 3.9 million people work in the IT services business. 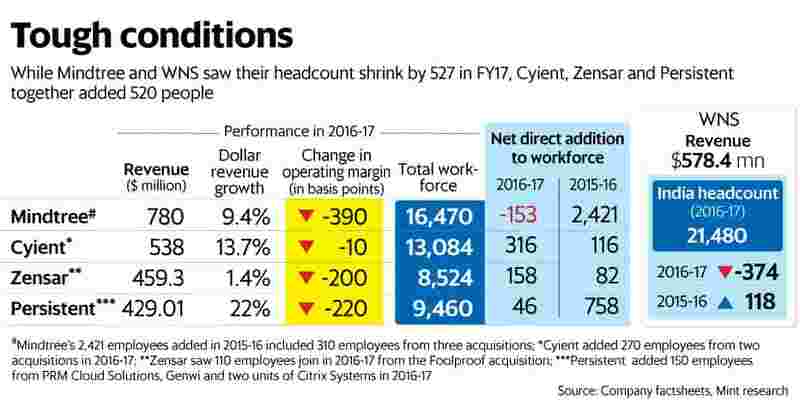 Hiring has also slowed at larger companies: Infosys Ltd saw a net addition of 6,320 employees in 2016-17, the second lowest number added in a year since 2003 (In 2013-14, the number was 3,717). “Big is no longer beautiful," said Phil Fersht, chief executive of US-based HfS Research, an outsourcing-research firm. “This is a war of many battles being fought where smart service providers are aggressively implementing RPA (robotic process automation) into their own operations to drive down their delivery costs and reduce their own headcount. Hence, services providers will be hell-bent on destroying each other and the winners will be those who eventually succeed in winning more work than they lose amidst all the destruction"
Worryingly, profitability at all the five smaller firms declined, and as employee costs account for more than half of total operating expenses, some executives in the business say the trend of more companies trimming their workforce is unlikely to reverse. “Both revenue and profitability are under pressure. Now, this is not going to change in the near term. The only lever available to companies is that you start re-looking at some of the current roles and look at which jobs can be replaced by automation tools," said the human resources head at one of the largest IT firms on condition of anonymity. “The advent of technologies like data analytics, AI (artificial intelligence), machine learning and migration to the cloud and platform-based applications means that there has been a gradual shift in the nature of the work and it takes significantly lesser amount of efforts to do the same work, and this is one of the primary reason why (hiring in) the traditional IT services business is going down," added Anand Deshpande, chairman and managing director, Persistent Systems. That’s bad news for young engineers graduating from India’s 4,000-odd engineering colleges. In 2016-17, around 120 engineering colleges decided not to take on new students, PTI reported on 30 April, without citing reasons for the decision. An executive at Mindtree said his company would “get into hiring mode this year". “The closest analogy I can draw to our decline in workforce is that somebody who was very fit, put on a little weight, became obese, and is now shedding excessive weight. Hiring should increase for this year and we will become strong again," said Rostow Ravanan, chief executive officer (CEO) of Mindtree. Keshav Murugesh, CEO of WNS Group, pointed out that the business process outsourcing sector continues to grow faster than IT services and that his company had “created jobs beyond Indian shores, in countries like South Africa, Philippines". Still, he added, “because of newer technologies, growth in revenue will be more than growth in headcount". Executives at Zensar and Cyient did not respond to emails seeking comment sent on 27 April.